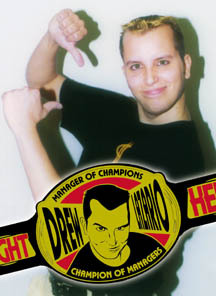 “Hot Shot” Drew Lazario is the self proclaimed “Manager of Champions, Champion of Managers” and actually wears his own championship belt. Always accompanying Dennis Gregory and "The Fabulous Firebird" Phoenix to the ring, Lazario often gets involved in matches, which is big help to his wrestlers. Any opponent facing either Gregory or Phoenix is at a decided disadvantage before the contest even begins, simply because of Lazario’s presence. Lazario recently assumed managerial duties for Sterling James Keenan as well. Now the "Hot Shot" leads one of the most prestigious stables in all of wrestling.